I love the Arcade Stitch, don't you? A queen of a stitch for sure. You can watch my video tutorial here or find the written stitch pattern here but if you're in the mood for an upgrade; a looser, more frivolous kinda gal, then this Fancy Arcade Stitch is your ticket. I discovered this vintage stitch pattern in the Vogue Dictionary of Crochet Stitches by Anne Matthews. I like the book, it's got some great stitches in it, lots that I've never seen before but there are two things that I not keen on. Firstly the stitches have not been given names. This makes me sad because all stitches deserve a name. Not only that but I've been forced to give it my own name because I have to call it something in order to present it to you. So it may be called something else, I'm sure that someone will let me know, but for now it is the Fancy Arcade Stitch. I like it. The second thing that is a bit confusing with the book is the stitch explanations are given with both UK and US terms at the same time. So, for instance it will say 1tr/dc in next stitch which doesn't sound too bad but when you're reading a lot of instructions and crocheting at the same time, things can get pretty hairy! 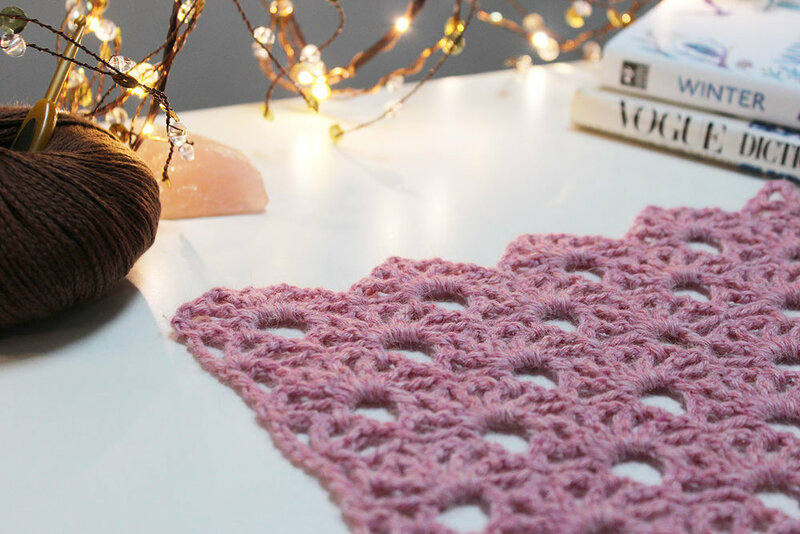 You can use any weight yarn and a corresponding hook. For the tutorial I used Cascade 220 in the colour Olive (now discontinued) and a 6mm hook. Chain in multiples of 10 and add 7. 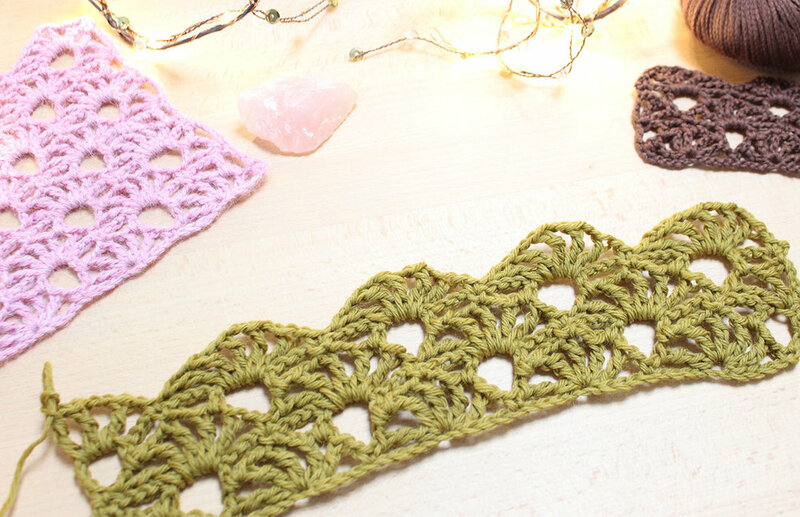 Special stitch: 5dtr lace cluster - (1dtr, ch2) x 4, 1dtr in same stitch (5dtr in one chain/stitch with four ch2 spaces in between). Set up Row. 1dc in 2nd chain from hook, *ch1, miss 4st, 5dtr lace cluster in next st, ch1, miss 4st, 1dc in next st; repeat from * to end finishing with ch1, miss 4sts, (1dtr, ch2, 1dtr, ch2, 1dtr) in last st, ch1, turn. Row 1. 1dc in first st (last dtr from previous round), ch3, 1tr in 2nd ch2 space, *ch2, 1tr in first ch2 sp of next fan, ch3, 1dc in middle dtr, ch3, 1tr in last ch2 sp; repeat from * to end finishing with ch1, 1dtr in last st (turning chain of previous round), ch7, turn. Row 2. (1dtr, ch2, 1dtr) in first st (last dtr from previous round), *ch1, 1dc in next dc, ch1, 5dtr lace cluster in ch2 sp; repeat from * to end finishing with ch1, 1dc in last st, ch5, turn. Row 3. *1tr in first ch2 sp, ch3, 1dc in middle dtr, ch3, 1tr in last ch2 sp, ch2; repeat from * to end finishing with 1dc under turning chain, ch1, turn. Row 4. 1dc in first st, *ch1, 5dtr lace cluster in ch2 sp, ch1, 1dc in next dc; repeat from * to end finishing with ch1, (1dtr, ch2, 1dtr, ch2, 1dtr) under turning chain, ch1, turn. Repeats rows 1 - 4 for pattern. You can use any weight yarn and a corresponding hook. For the tutorial I used Cascade 220 in the colour Olive and a 6mm hook. Special stitch: 5tr lace cluster - (1tr, ch2) x 4, 1tr in same stitch (5tr in one chain/stitch with four ch2 spaces in between). Set up Row. 1sc in 2nd chain from hook, *ch1, miss 4st, 5tr lace cluster in next st, ch1, miss 4st, 1sc in next st; repeat from * to end finishing with ch1, miss 4sts, (1tr, ch2, 1tr, ch2, 1tr) in last st, ch1, turn. Row 1. 1sc in first st (last tr from previous round), ch3, 1dc in 2nd ch2 space, *ch2, 1dc in first ch2 sp of next fan, ch3, 1sc in middle tr, ch3, 1dc in last ch2 sp; repeat from * to end finishing with ch1, 1tr in last st (turning chain of previous round), ch7, turn. Row 2. (1tr, ch2, 1tr) in first st (last tr from previous round), *ch1, 1sc in next sc, ch1, 5tr lace cluster in ch2 sp; repeat from * to end finishing with ch1, 1sc in last st, ch5, turn. Row 3. *1dc in first ch2 sp, ch3, 1sc in middle tr, ch3, 1dc in last ch2 sp, ch2; repeat from * to end finishing with 1sc in fifth of turning chain, ch1, turn. Row 4. 1sc in first st, *ch1, 5tr lace cluster in ch2 sp, ch1, 1sc in next sc; repeat from * to end finishing with ch1, (1tr, ch2, 1tr, ch2, 1tr) under turning chain, ch1, turn.